Schedule a free consultation with one of our certified CoolSculpting® specialists to discuss the areas you may want to be treated. During the consultation, we will develop a customized CoolSculpting® treatment plan that addresses your problem areas. Additional sessions may further enhance your results. Your individualized treatment plan will be tailored to your body, your goals, and your budget. The CoolSculpting® procedure is an FDA procedure which uses controlled cooling to safely target and eliminate diet and exercise fat. Fat cells freeze at higher temperatures than surrounding tissues. CoolSculpting® technology safely delivers precisely controlled cooling to gently and effectively target the fat cells underneath the skin. The treated fat cells are crystallized (frozen), and then die. For the area(s) to be treated the device is positioned on your body and controlled cooling is applied. During your procedure, you may choose to read, check email, or even take a nap or get another cosmetic treatment. The CoolSculpting® fat freezing procedure is completely non-surgical, so you can typically return to work and normal activities immediately. Our highly qualified staff will take care of you after your treatment. In the weeks and months following your procedure, your body naturally processes the fat and eliminates these dead cells. Once the treated fat cells are gone, they're gone for good. If the CoolSculpting® fat freezing procedure is right for you. ANSWER: The price for CoolSculpting® procedures varies depending on your areas of concern, the number of sessions needed, and your ultimate goals. We will help create a customized treatment plan, in person, that’s tailored to your body, your goals, and your budget. 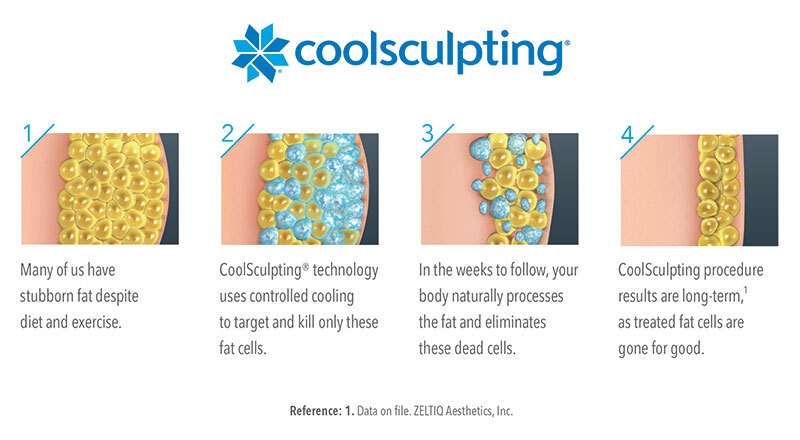 The length of your CoolSculpting® session will vary depending on the number of areas being treated during one visit. We may schedule additional sessions in order to meet your goals. ANSWER: The CoolSculpting® procedure is FDA-cleared for the flank (love handles), abdomen, and thigh. With over one million CoolSculpting® treatments performed worldwide, it is proven to be a safe and effective treatment for non-surgical fat reduction. ANSWER: Yes, you can. The CoolSculpting® procedure is completely non-surgical, so typically you can return to normal activities immediately. Often times, patients return to work after their CoolSculpting® session is over. But your body will still flush out fat cells and continues doing so for up to four to six months after treatment. ANSWER: No supplements or pills are required and you do not have to adopt new diet and exercise habits. Many patients feel more motivated to take care of themselves after their CoolSculpting® treatment. It is as if they get a second lease on their body and want to start anew again by taking even better care of themselves. ANSWER: Many people, after seeing the results from their CoolSculpting® procedure, take even better care of themselves. However, if you do gain weight, you may gain it evenly all over your body, not just in the treated areas.